Here are some photos that should tell with no words the calm disposition of our wonderful stallion. 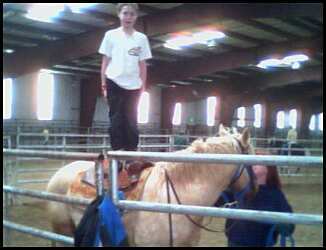 AND CADEN ON HANK AGAIN! 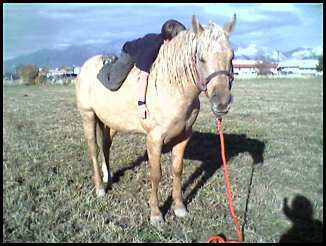 Whenever people express interest in breeding a mare to Hank, we always say, "Be sure to come ready to ride." 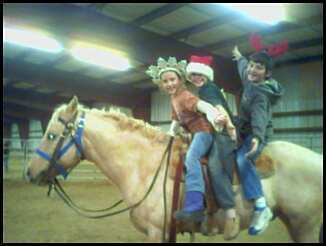 We have had every type of rider on Hank, from infants to novice riders, to experienced trainers. He seems to sense who's on him and for those who are frightened, he puts his head down and plods along like he's on the way to the glue factory. For those who know horses, Hank performs like a champ, with strong movement, a light mouth, and responds to leg and voice cues perfectly. He throws this combination of knowledge and kindness onto his get.